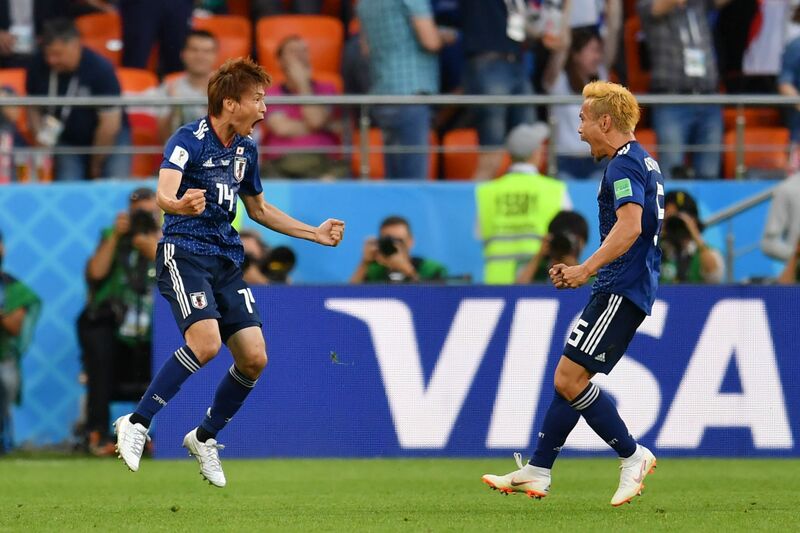 YEKATERINBURG, RUSSIA - Goals from Takashi Inui and Keisuke Honda helped Japan come from behind twice to earn a gutsy 2-2 draw with Senegal at the World Cup on Sunday, inching both teams closer to a coveted place in the knockout round. 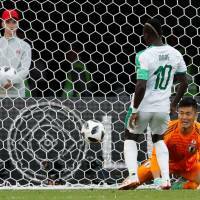 Liverpool star Sadio Mane got the West Africans on the board early, largely thanks to haphazard defending by Genki Haraguchi and suspect goalkeeping by Eiji Kawashima, and Moussa Wague gave them the lead again in the second half. Inui, who was everywhere for Samurai Blue, scored Japan’s first equalizer after some fine work by Yuto Nagatomo and super sub Honda equalized in the 78th minute, just six minutes after stepping onto the pitch. Japan and Senegal are tied atop Group H with four points. Colombia is one point behind in third place and Poland is fourth with no points. A draw against Poland on Thursday would be enough to secure Japan a place in the round of 16. The Poles, who were group favorites entering the tournament, can no longer advance after losing to Colombia 3-0 later in the day. Colombia will face Senegal on Thursday with both teams still able to advance. Senegal boss Aliou Cisse put three up front for the match at Ekaterinburg Arena, his team’s first against an Asian opponent at a World Cup. It showed his attacking intent and his team repaid him with a goal after 11 minutes, although Haraguchi and Kawashima were at fault. The ball was crossed to the back post and when Haraguchi’s attempted clearing header dropped into the path of Youssouf Sabaly he was quick to shoot. Kawashima punched a shot he should have caught and the ball ricocheted off Mane’s knee and in, giving Senegal a deserved lead. After dragging themselves back into the game, it was a piece of sublime skill on the left that got the Japanese even before halftime. Nagatomo collected a long pass with wonderful midair dexterity, his first touch helping him elude two closing defenders before Inui arrived. Inui took a touch and bent his shot around diving Senegalese keeper Khadim Ndiaye. 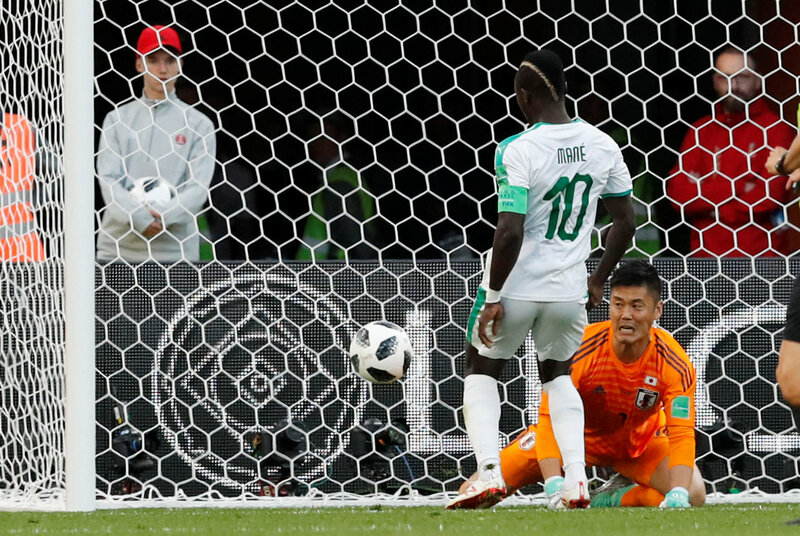 Senegal started the second half well but it was Japan who should have gone in front at the 60-minute mark, when Yuya Osako failed to make contact with a cross inside the six-yard box. Osako did better four minutes later when he laid on a sweet backheel that Inui struck off the crossbar. Wague, who was at the center of Senegal’s most enterprising play, then put them back in front. 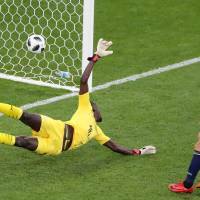 Sabaly turned in the box and hit a low cross that was helped into the path of Wague by Mbaye Niang and the Belgium-based defender slammed a shot past a helpless Kawashima. After the goal, Nishino immediately pointed to Honda and six minutes later the recently installed manger was clenching his fist. 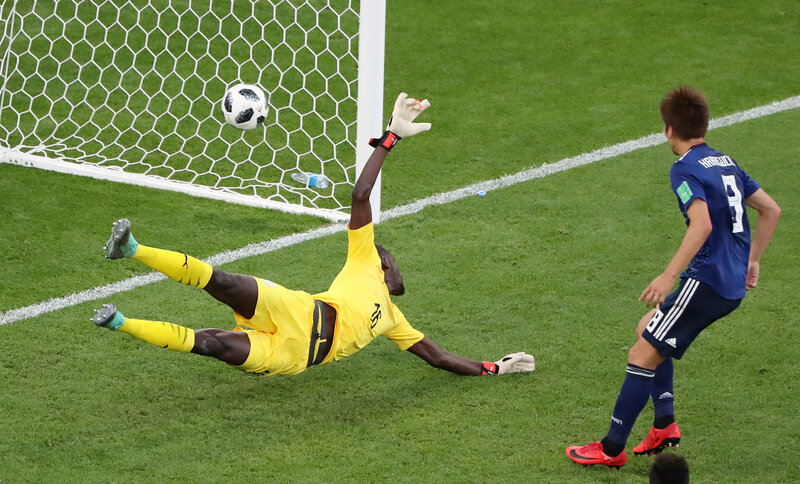 Honda was in just the right place to meet a ball ripped back from the goaline by Inui, and the blond-haired Pachuca man pumped it into the back of the net from just outside the six-yard box with the Senegalese defense in shambles. Honda has now been directly involved in seven of Japan’s last 10 World Cup goals, scoring four and assisting three, this being his first goal in 16 international matches. The former AC Milan forward also scored at the 2010 and 2014 tournaments and is the first Japanese player to score at three World Cups. He has 37 international goals in his career. Cisse, the captain of the 2002 Senegal team that reached the quarterfinals, said his team needs to be more aggressive.